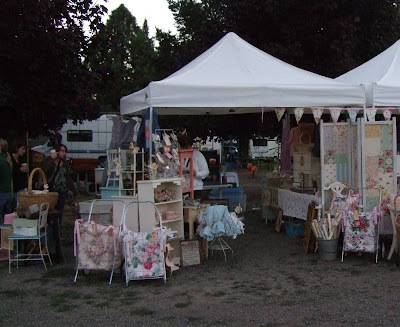 I may have mentioned that Isabel and I have shopped at the Coburg Antique Faire the last few years, but that this year we decided to sell there too. Coburg is a sweet little town about two hours south of where we live. We drove down on Saturday afternoon and set up the bigger stuff. We then came back super early Sunday morning to finish up. It was so funny to see lots of buyers with flash lights and head lamps shopping in the dark. I had heard about that before, but since I have never shopped that early myself, I never saw it actually happening. Our friend Braeda took this picture for us on Isabel's camera. Don't we look like we are having fun? We had a great day seeing lots of our friends and we even met some new friends. 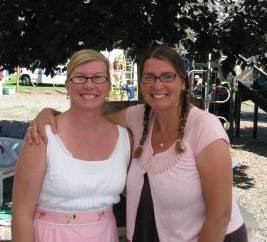 A few sweet gals stopped by to say hi and that they read our blogs. We even had several buyers who we met at other sales like Expo stop and say hi. Here are some pictures of our good buddies booths. We were all in the same area so it was fun to run back and forth a bit to check up on each other when we had time. Of course, we couldn't go to this sale without shopping a little bit. Isabel and I took turns and we both were able to find a few neat things. 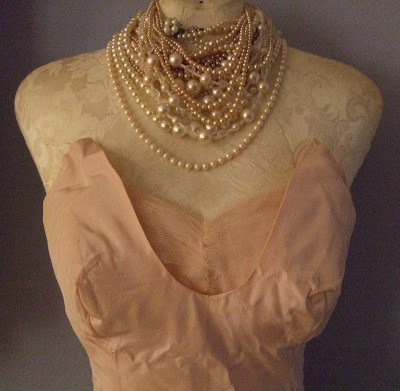 I found this adorable pink vintage prom dress for only $4.00. Okay, you can hate me now. Here's a close up of the bodice. 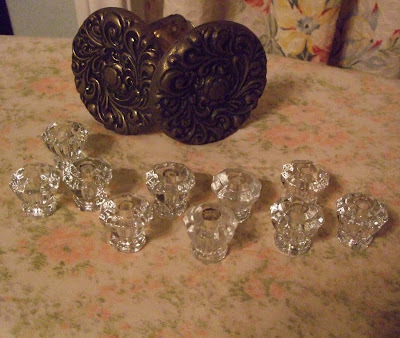 Also found these brass curtain tie backs and ten of my favorite vintage glass knobs. I traded Isabel an old doll I found for this painting. You can see the doll on her blog. 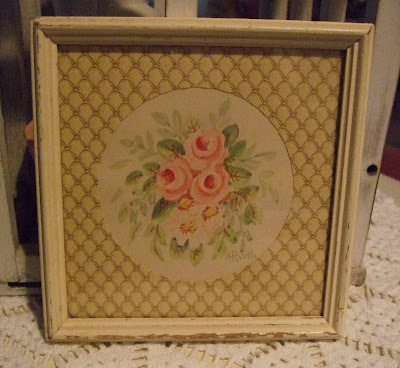 I forgot to take a picture, but I also found a cute pink roses apron and a lovely crocheted hanger for my collection. I was really good and didn't bring any big furniture home. Hubby was pleased about that. Laura, who I met at Farm Chicks and who is a BFF of my BFF Timi, gave me this award recently and I am so honored to accept it. I have gotten a few awards in the past for my little ol blog and it is always so nice to be recognized in that way. So, thanks so much Laura. I really, really appreciate it! Pam, at One Gal's Trash tagged me to list 7 random things about myself. It is always so hard to come up with things to share, but here goes. 1. I am a rule follower. I guess I always worry about getting caught if I break the rules. This probably goes along with being a people pleaser. 2. I love teen movies. Always have and now that I'm in my 40's I still watch them. 3. I have a funny game I like to play when I'm out thrifting. 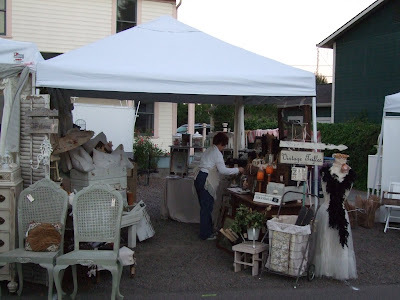 If I find several items at one place, I like to find at least one thing that I can sell for at least the total amount I pay for all the items at one place. Does that make sense? That way I feel like every thing else I got for free and whatever money I make selling the items is pure profit. I know, silly, right? 4. In high school I was voted "Miss Preppy" even though I wasn't really. I wore mini skirts before anyone else did and my outfits were always very color coordinated and cute. I was also voted, "Best Freckles." My freshman year in college I was voted, "Biggest Flirt" in my dorm. Again, I don't agree with this one. I just had a lot of male friends and being the affectionate person I am, I gave out lots of hugs. 5. On my husband and my first date in college we drove to a bar on my scooter (the motorcycle kind). I was wearing a fluffy coat and I remember he put his hands in my pockets to stay warm. We were having a great time until we got pulled over by the police on the way home. The police officer said, "you know this vehicle is only for one person." To which my husband replied, "but I was holding on." I ended up getting a ticket which was a small price to pay for my silly new boyfriend who eventually became my great husband. 6. When we made the decision that I would quit my job to be a stay at home Mom, it literally cut our income in half. We had some pretty tough years financially, but I never regretted our decision. It has been the most difficult and rewarding job I have ever had. 7. I love jewelry. Especially vintage inspired jewelry and I seem to have accumulated quite a collection of it. But, I rarely wear more than just my wedding ring, an aqua marine ring, my diamond solitaire necklace my hubby gave me for our 15th anniversary and a pair of simple earrings. Wow, that was really hard. I know I have lots of stories and feel like I have led an interesting and fun life, but I always have a hard time coming up with interesting things to tell about myself. If you are newish to my blog you can read more stuff about me by clicking on the "stuff about me" category at the bottom of my sidebar. 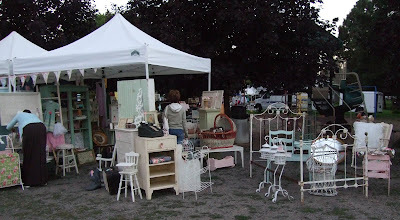 On my next post I will share some pictures of our booth at the Fall Premier Sale and some new thrifted finds. Lisa, those were fun and interesting things about yourself. And yes, I am jealous of that totally fabulous dress, and $4.00 to boot! You did good girl! What a fun time that must have been for you two. Also, with two it gave you each a chance to look for treasures. The prom dress is fabulous! 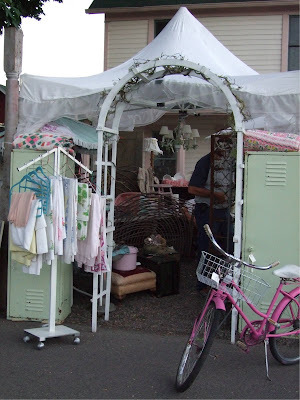 Thanks for posting the great pictures for us to go on a virtual shopping trip! Cute, cute, cute! 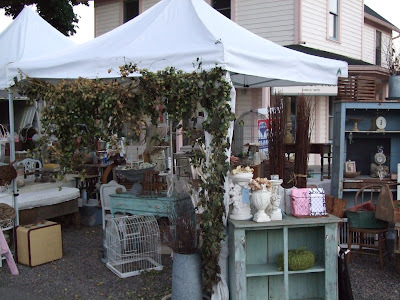 Love the antique faire. It looks like it was a blast! And that prom dress is awesome! Well, I WANT Kathy's little house! And yes, your prom dress is ethereal it is so beautiful. Kudos! Your quips about yourself are delightful, and all of you vendors work so hard to please an audience. I am a lazy schmuck when it comes to that sort of thing. I say you are one of the best! What fun I am having reding over your blog and enjoying the eye candy. The booths looked gorgeous and so enticing. I sure wish we had something like that near me. I'd be the number one customer, much to my husbands dismay, I am sure. 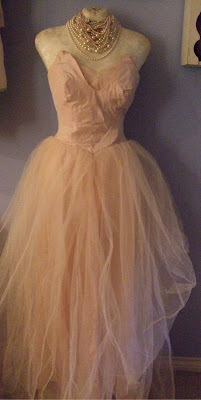 Love the vintage prom dress. Hey Lisa! 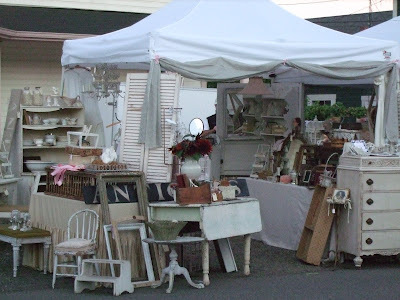 It looks like you had a blast this past weekend and your booth looks beautiful. We were planning to go for a visit, but we really needed to get this farm in order. Things were getting a little crazy around here to say the least!! Thanks for the pictures. Hope to see you soon! Sounds like you had a great time! I really like that picture, too. And the dress. Oh, those booths look fabulous!! Love the dress you found for $4!! It was fun reading your interesting facts about you!! love the dress! 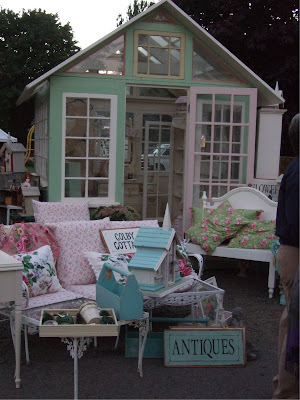 Wish i was at the antique faire. 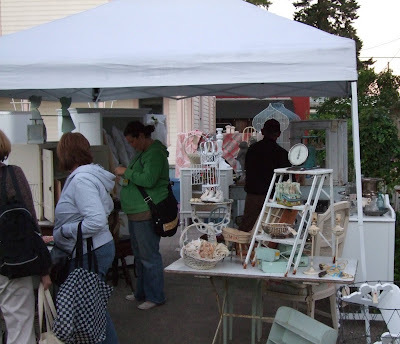 Oh my I do wish I could get to those antique fairs, I can see soooo many things I like just from the photos. You guys have the best stuff over there!! so lovely getting to know you better, love the story about the scooter!